PLEASANTON, California, Jan. 22, 2019 /PRNewswire/ -- Roche (SIX: RO, ROG; OTCQX: RHHBY) announced today the addition of two new sample types for utilization on the cobas® 4800 System: Dried Blood Spot (DBS) for qualitative early infant diagnosis (EID) and the cobas® Plasma Separation Card for quantitative viral load testing. These solutions further improve access to HIV diagnostic tests. "The inclusion of these additional sample types across all of our molecular diagnostic platforms will expand access to testing in the countries hardest hit by HIV," said Uwe Oberlaender, CEO Roche Molecular Diagnostics. "This is another example of our ongoing commitment to providing life-saving diagnostics in the fight against HIV and AIDS." Children born with HIV are particularly vulnerable. Without reliable early infant diagnosis and treatment, 50% of them will die before their second birthday.1 The use of dried blood spots (DBS) can facilitate PCR testing, and more importantly make sample collection easy, even from the smallest infant. A quick heel prick is all that's required to produce an adequate sample. 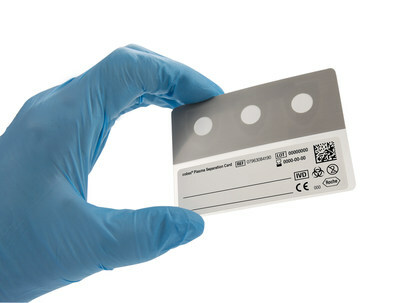 The cobas Plasma Separation Card is a stable and easy-to-use sample collection device for HIV plasma viral load testing. By providing a small amount of a patient's blood from a fingertip, this specially designed card simplifies blood collection and sample transportation - even in areas of extreme heat and humidity - while meeting WHO requirements for determining HIV treatment failure. The cobas Plasma Separation Card can now be used with the cobas 4800/6800/8800 and the COBAS® AmpliPrep/COBAS® TaqMan® System. It is also included in the Roche Global Access Program as a solution to help expand access to diagnostics in countries hardest hit by HIV. In 2014, Roche announced, the Global Access Program for increased access to HIV diagnostics. Roche partnered with national governments, local healthcare facilities, communities and international agencies, including UNAIDS, CHAI, Unitaid, the U.S. President's Emergency Plan for AIDS Relief (PEPFAR), Global Fund, and Centres for Disease Control (CDC), to establish programs that would go beyond providing diagnostic tests. Since its inception, the program has expanded substantially in menu and geographic footprint to provide increased access to diagnostics at affordable pricing for qualifying organizations in eligible countries with the highest disease burden. In partnership with the Joint United Nations Programme on HIV/AIDS (UNAIDS), the Clinton Health Access Initiative (CHAI), Unitaid, the U.S. President's Emergency Plan For AIDS Relief (PEPFAR) and the Global Fund to fight AIDS, TB and Malaria, Roche has been working to increase access to HIV diagnostic solutions to achieve the UNAIDS 90-90-90 goal to improve people knowing their status, getting on HIV therapy, and suppressing the virus from replicating. 1 Start Free Stay Free. https://free.unaids.org/. Accessed 14Nov2018. 2 WHO HIV Key Facts. http://www.who.int/en/news-room/fact-sheets/detail/hiv-aids. Accessed 15Oct2018. 3 UNAIDS Global HIV & AIDS statistics — 2018 fact sheet. WHO HIV Key Facts. http://www.who.int/en/news-room/fact-sheets/detail/hiv-aids. Accessed 18Oct2018. 4 WHO HIV Key Facts. http://www.who.int/en/news-room/fact-sheets/detail/hiv-aids. Accessed 15Oct2018.